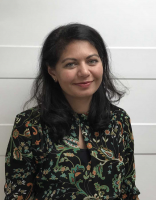 Dr Anita Amin is a consultant dermatologist who was the Lead Consultant Dermatologist covering East Sussex for East Sussex Healthcare Trust until 2019. She is an NHS consultant in Brighton, Worthing and Shoreham. Graduating from Cambridge University Medical School, she gained extensive experience in adult general internal medicine at Addenbrooke’s Cambridge University Hospital, where she obtained Membership of the Royal College of Physicians. Large scale conferences can also be organised.